Duration: Monaber or Es Finicular to Cala Tuent 4/5 hrs +; 6hrs via Casa des Moro & Pas de s'allot mort. This section covers the area between the Cami de Cingle and the coastal trail of Sa Costera, encompassing one of the wildest and least inhabited area of the serra. Those who want to walk all the way to the sea from either the summit of Puig Major or the Penyal de Migdia will have to look up the ascent and descent on the relevant pages and join up with the trails described here after. To the exception of the two Binis and of the abandoned Casa del Moro, there are no farms, fincas, or other man made buildings along the remote routes that cross the area; the relief is tortured, rocky, riddled with ravines, crags and minor pinnacles. The trails are only trails by name, and while vague cairns lines generally mark the way, wild vegetation and long grass have swallowed much of the remains of ancient paths and many of the more recent way markings. You are very unlikely to meet anyone else here, and highly likely to get lost a few times along the way. On the plus side, this is an other example of the splendid lonesome wilderness, and few will remain unmoved by the grandiose nature found in the area. Most will start the walk to the sea at Es Finicular or Monaber, but these route can easily be done as an extension to a climb to the Penyal de Migdia. Those in need of a real mad challenge can start at Cala Tuent and hike all the way up to the summit of Puig Major. A more moderate but still challenging circular walk starts down in Cala Tuent, and follows a route first along torrent des Diners, then up a mountain side towards the higher reaches of the Torrent de s'Allot Mort (through the Pas of the same name), up a steep bank and back down towards the sea side eventually reaching Sa Costera path leading back to Cala Tuent . Note that the routes described here after are for the more experience hikers as way finding is not easy, the terrain difficult, and help unlikely to come by to say the least. Mobile phone reception is patchy at best, and the area gets extremely hot in full summer. Stay away from Mid June till mid September . Car: Most people with their own transport will start at Es Finicular on the Escorca (Gorg Blau) to Sa Calobra road (Ma 2141), a short distance before the Col des Reis and the start of the long descent to the sea. Look out on the left hand side of the road for a rounded, perfectly built dry stone wall. You will see a power line going up on a ridge above. There are often cars parked here as this is the starting point for many popular hikes. The name es Finicular refers to a post war cable car project that would have started here and run all the way to the summit of the mountain. The project was shelved and Puig Major became a military base instead. You will have to hitch a ride back up from Cala Tuent, usually quite an easy thing to do. By bus: from Soller and/or Palma, your best option is to join the Cami de Cingle at its start on the Soller side of the mountain. take service 354 at 08:40 from Soller town (1st of April till 1st of October only, no service on Sunday) and jump off the Soller side of the Tunnel de Monnaber. There is no proper bus stop at the Tunnel de Monaber, so if you fail to sweet talk the driver into dropping you off, you will then have to hop off at the army camp a good two km away and backtrack. From Cala Tuent you will need to hitch a ride back up to the main Soller to Lluc road from where you can catch service 354 shortly before 6 pm Monday to Saturdays. The walk starts and finishes in Cala Tuent. Park by the Finca close to the river. The only option to reach Cala Tuent by public transport is to take a day trip boat from Soller in season to Sa Calobra and walk (+/- 1:30 min each way). Renting a car is usually cheaper and easier. For those starting at the Tunnel de Monaber, walk down the asphalt from the mirador on the Soller side for about half a kilometer, till you reach the first clear track branching off to the right, slightly before the hairpin bend on the asphalt. Take this track, pass the steel rockfall protection nets, and climb over a style by gate. Take a right uphill here in order to avoid a finca on the track further ahead. Keep going till you reach the coll des Cards Collers, where a lonely iron cross reminds you of the sanctity of your surroundings. ( Note: here you have the option to abandon the Cami de Cingle and take a faint path (orange on the map) to the left that will lead you towards Bini Petit and on to the pas d'en Ruc. I have not taken this path but other hikers reports indicate it is passable.) The normal route is to keep on on the jeep track (Cami des Cingles), going slowly downhill, enjoying good views over the Bini farmsteads and the sea side watch towers. After at the most an hour's walk (from the tunnel) you will reach the Pla d'en Gumbau where the main jeep track will take a sharp turn to the left towards the farmhouses. This is where the trail to the sea starts. For those staring at Es Finicular, find the cairned trail going uphill towards the ridge above the road. You will reach a small col at Porxo Esbucat with some electricity lines. Push on on the main trail, pass the Bini Gran gate and reach the Pla d'en Gambau in about 45 minutes where the jeep track starts. Once you have reached the crossroads at the Pla d'en Gumbau, look towards the sea. There is a field in front of you; crossover to the seawards side of this field, and follow its edge in a westerly direction, slowly curving more northwards as you go around the rocky outcrops on your left. Keep your eyes peeled, for you have to find the first cairns of the trail to the sea somewhere amongst the rocks ;they are there, it is just a matter of finding them. Follow the cairned route through the rocky maze, and you will soon reach de Pas de s'Argenta, going steeply downhill on a well preserved ancient dry stone path. Shortly after reaching the bottom part of the Pas you will loose the old trail, and eventually the cairns will disappear as well in the overgrown shrub. Power through the vegetation down hill to the bottom of the small valley, till you reach a sort of flatish clearing, with the very obvious start of the gorge of the Torrent de Dinners at its northern end. Despite near nil chances of meeting anyone around here, this is the local Piccadilly circus, where you have a choice of three routes. find the line of cairns going uphill to the east, and you will eventually reach the "Clot Carbons", a series of crater said to have been created by meteorites. 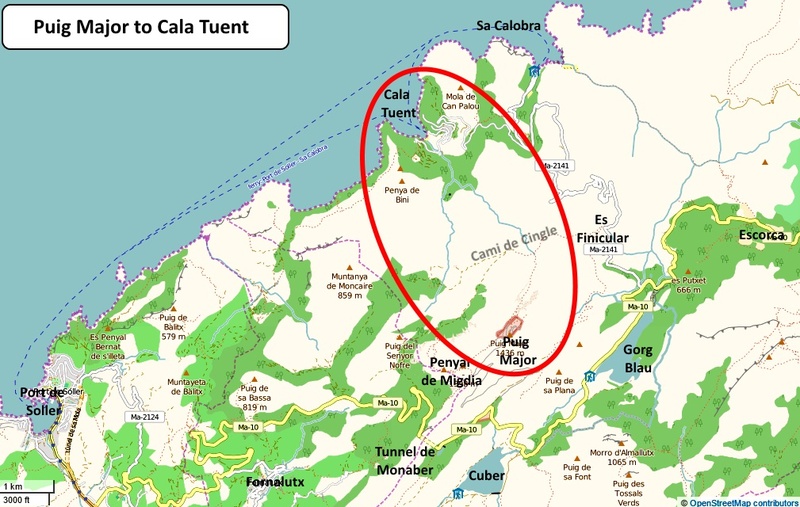 I have not gone this way, and this is remote remoteness; the map however does indicate that this way is passable to the Pas d'en Termes above Cala Tuent. It is likely to have been cairned at some stage, but very, very few people ever go that way, so do not take this route lightly. find the line of cairn going west; this is a slightly better trodden route, and is in my view the best choice for those coming from Es Finicular or Monaber; coming down from one of the summits, this is a long and hard way to Cala Tuent, more than the average person can deal with after a summit climb (3 to 4 hrs on difficult terrain). If you choose to go this way, from Piccadilly Circus head west uphill along the line of cairns to the Casa des Moro, a troglodyte dwelling in a very good state of conservation. This makes a good spot for a lunch break. Then head down still westward along the line of cairns to the bottom of the Torrent de S'allot Mort and up over the other side, following at times sections of ancient footpath (NB: you apparently can not follow the torrent itself downstream as there are a number of sheer drops that have to be abseiled). Once up above the other side of the torrent, your route will be slightly more north. This is a section difficult to navigate and the terrain remains just as unforgiving, but you will eventually reach a split in the path, with a line of cairn heading to the right, and the other, slightly better trodden way straight ahead. The fast way home is straight ahead via the pas des Marge and down to sa Costera, see the S'Allot Mort circuit for details The right fork is the more difficult but most interesting way home (count an other 90 to 120 minutes if you dont get lost ), leading you at first slowly downhill, then very steeply down a gully back to the bottom of the torrent de s'Allot Mort. You then follow the torrent down for a 100 meters at the most to reach a cliff top; the way is on the right bank, from where fresh cairns will lead you down the well marked pas de s'Allot Mort, consisting of minor scrambles on fairly steep terrain. You will rejoin the torrent des Dinners soon after the pas, that you follow down to Cala Tuent. See the S'allot mort circuit page for details. go straight ahead into the Torrent des Dinners gorge. This is the fastest way to cala Tuent. After walking a short distance down the torrent, keep a sharp lookout on your right for a small grassy ledge allowing an exit from the bottom of the gorge onto higher round. This is the Pas de s'Estaca, at the top of which you will find a new cairn trail leading you for the next hour and a half over very rocky and uneven ground northwards to the Pas d'en Terme, enjoying great views over the coast on the last section of this stretch. The Pas d'en Terme, at the end of the cairn line, is right above the Col de St Laurent and right across from the Torre de Tuent; it consists of an old, winding, dry stone path in quite good condition, twisting its way down the slope to the asphalt below, that you will reach in about 30 minutes and a few hundred meters to the west of Col de St Laurent (after a bit of a way finding struggle on the last few hundred meters). You have arrived.